Sometimes replacing a deck or porch on a home can be the best thing that ever happened to that home—and in more ways than one. Recently we completed a job you could describe like that. 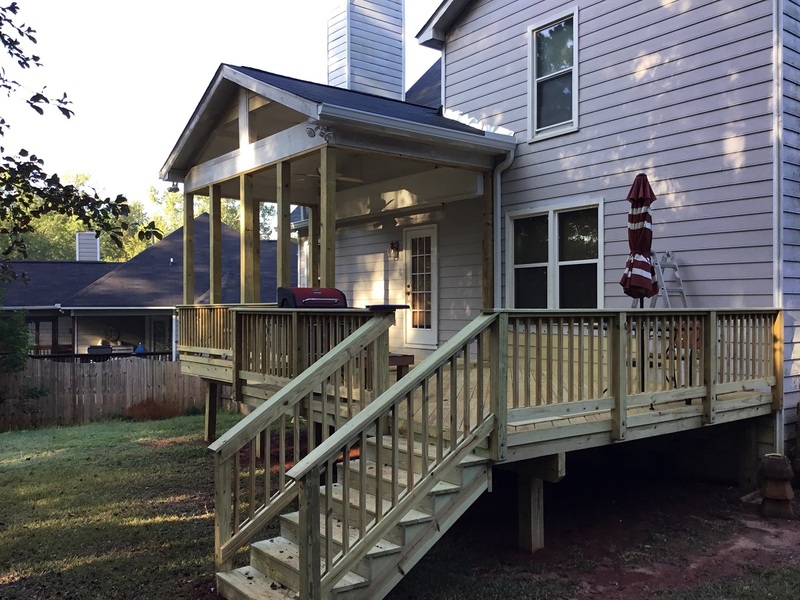 Of course these Macon, GA, homeowners in the Northside Drive area love their revitalized outdoor living space with a new deck and porch. Unfortunately, when we demolished their old deck we discovered it had not been flashed properly. There was rot on the siding and house band, which we had to replace. Had the old deck remained much longer, the interior flooring joists would have been affected next. Luckily we caught and repaired the damage before it could spread beyond the deck. — Image of area before we began project. To paraphrase Forrest Gump, an older house is like a box of chocolates. You never know what you’re gonna get when you remove old construction and reveal what’s under it or behind it. This home was built in the ‘70s and has had multiple owners. The back porch and deck had been built by previous homeowners. In fact, three different sets of homeowners had added onto this home’s outdoor living spaces over the years, and not a single one of them was a professional carpenter. 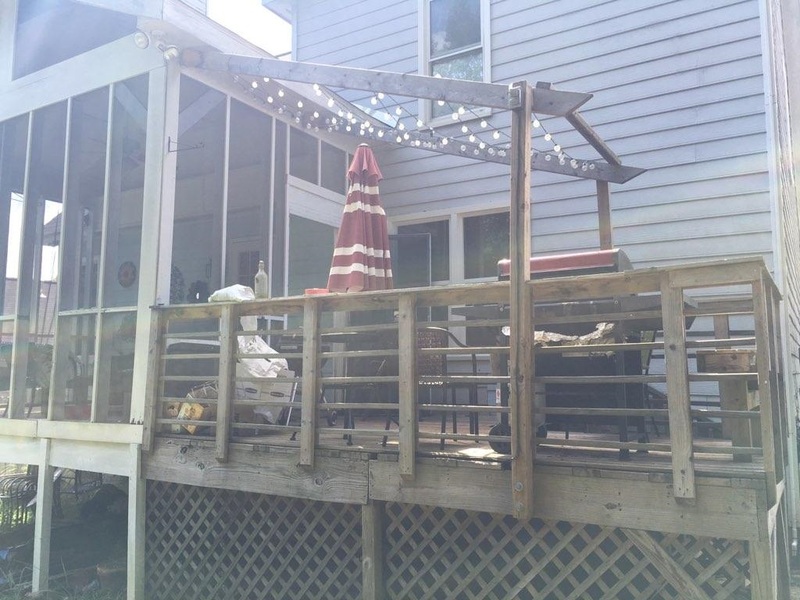 The current homeowners, our clients, had been in the home for a couple of years and knew they wanted to replace the deck and screened porch. The deck clearly was not sound; it was rickety and actually had a hole in the floor. Needless to say, they couldn’t use or enjoy it. Shiny and New from the Floor to the Beam! 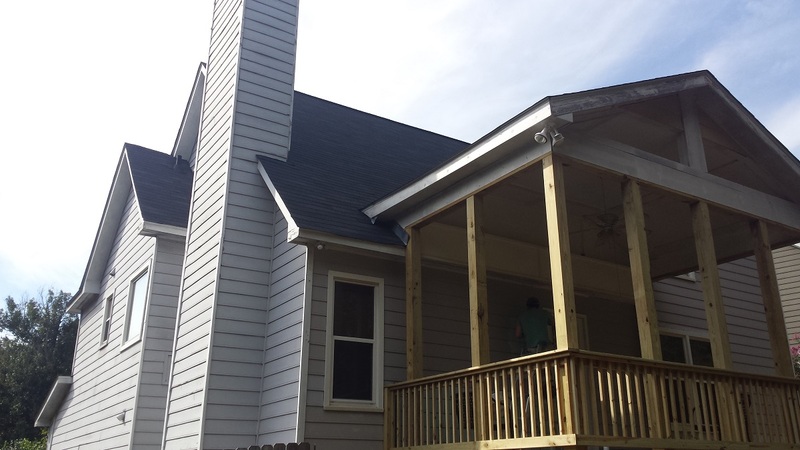 Macon-area porch builder and deck builder Archadeck of Central GA went right to work on a new porch and deck. The homeowners chose an open porch design rather than a screened porch this time. We were able to save the porch roof, from the beam up, but we did have to replace the porch walls and the floor. We added a new beam and two new posts, along with joists and a new edge band. We also installed new gutters. In replacing the deck, we designed and built a new deck that is sized more appropriately for the home. This was also the opportunity to position the deck stairs to match the walkway. We used pressure-treated pine for the deck floor and built a standard deck railing with pressure-treated pine as well. The homeowners are pleased with this deck now that the structure is sound! They also love that it was designed to be more in keeping with the layout of the home and landscape. If you are interested in replacing an aging deck, porch or combination outdoor living space, contact Archadeck of Central Georgia for a design consultation. 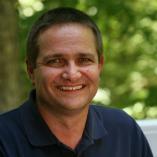 You can reach us by phone at 478-745-2000 or via email at [email protected].